Objective: Treatment of large advanced osteochondritis dissecans (OCD) of the elbow in young athletes is challenging. Methods: We retrospectively reviewed the results in 9 baseball players (mean age, 13.7 years; range, 12–15 years) who were followed up for a mean 21.1 months (range, 12–36 months) after osteochondral autograft. In this operation, cylindrical osteochondral plugs were harvested from a lateral femoral condyle and transferred to the lesion in humeral capitellum. After immobilizing the elbow by a splint for 2 weeks, the patients were encouraged to do range of motion exercises using an elbow brace with a hinge for 2 months. The elbow brace was applied to avoid excess stress to the implants on the capitellum and to the lateral collateral ligament. Patients were clinically assessed by the Japanese Orthopaedic Association elbow score (JOA score) and morphologically by radiographs as well as by magnetic resonance imaging (MRI). Results: Patients started playing catch at 3 months and returned to baseball at competitive level at around 6 months postoperatively. The average JOA score was 68.0 points before operation and improved to 98.7 points at follow-up. Bony fusion between the implants and host bone was observed radiographically at 3 months. MRI confirmed a durable load-bearing articular surface of the capitellum at 1 year. Conclusions: Osteochondral autograft with postoperative rehabilitation using an elbow brace is a reasonable treatment for young athletes with an advanced lesion of OCD of the elbow who desire a relatively quick return to their pre-injury sports activity level. Treatment for early-stage osteochondritis dissecans (OCD) of the elbow is principally nonsurgical. Consequently, patients cannot return to their sports activities for at least 1 year.1) If conservative treatment fails, the patient may undergo surgery as the next step. If patients desire an early return to their pre-injury activity levels and their lesion is at an advanced stage, osteochondral autograft appears to be one of several promising options.2) We retrospectively studied nine young athletes who used an elbow brace postoperatively and returned to playing baseball within 6 months of osteochondral autograft. To our knowledge, there have been few reports to date regarding the use of an elbow brace for postoperative rehabilitation of OCD.2) The purpose of this study was to elucidate the advantages of using an elbow brace and the effectiveness of osteochondral autograft for young patients with OCD of the elbow. We retrospectively reviewed the cases of nine young athletes who consecutively underwent osteochondral autograft in our institute for an advanced OCD lesion of the humeral capitellum. All patients were boys with a mean age of 13.7 years (range, 12–15 years). The growth plate of the capitellum was closed in four patients and open in five patients. All patients regularly played baseball in their school teams and all experienced elbow pain from sports activity. During surgery, the lateral collateral ligament was divided once to expose the osteochondral lesion in the capitellum. After debridement of the lesion, one or two cylindrical osteochondral bone plugs (diameter, 6.5 or 8.5 mm) were transferred from a lateral femoral condyle. Osteochondral autograft was performed using the Osteochondral Autograft Transfer System (OATS, Arthrex Inc., Naples, FL, USA) and press-fit fixation was obtained.3) After surgery, the elbow was immobilized in a plaster splint for 2 weeks. 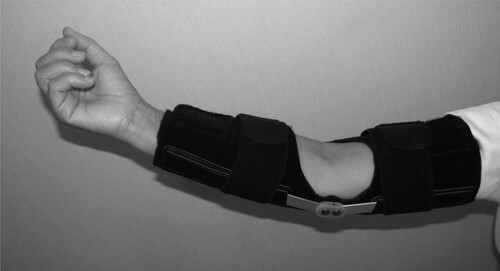 Then, active range-of-motion exercises using an elbow brace with a hinge (Nakamura Brace Inc., Ohda, Shimane, Japan) (Fig. 1) and muscle-strengthening exercises were carried out for 2–3 months. Patients continued to wear the elbow brace for 2 months postoperatively. At 3 months after surgery, patients were instructed to remove the brace and start throwing a ball. Patients could return to playing baseball at around 6 months after surgery. The Wilcoxon signed-rank test in StatView ver. 5.0 (SAS Institute Inc., Cary, NC, USA) was used for the comparison of clinical evaluation scores, and P < 0.05 was regarded as statistically significant. Written informed consent was obtained from all the patients. This study was conducted in accordance with the World Medical Association Declaration of Helsinki . All patients had early functional recovery and were able to return to their former sports activities. The mean duration from the surgery to the first participation in a baseball game was 5.8 ± 0.8 months (range, 4–7 months). The mean JOA elbow score was 68.0 ± 16.2 points before surgery; however, the score had significantly improved to 98.7 ± 2.7 points at 1 year after surgery (P = 0.001), and was 98.7 ± 2.7 points at the final follow-up (P = 0.001). All patients achieved bony union radiologically within 3 months. MRI confirmed congruity of the articular cartilage at 1 year after surgery (Fig. 2). All patients returned to their pre-injury activities and were satisfied with their final outcomes. (A) Preoperative X-ray demonstrated an osteochondral lesion in the capitellum of a 15-year-old boy (arrowheads). 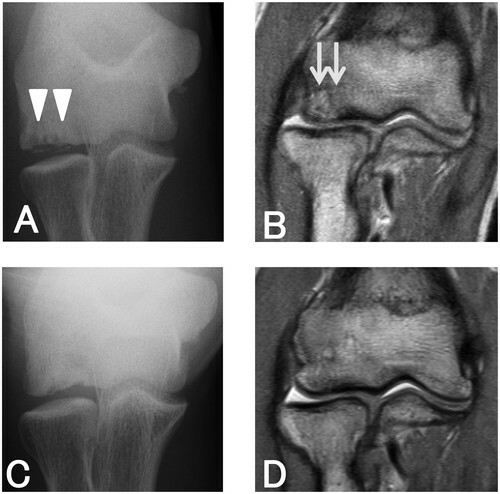 (B) Proton density-weighted MRI indicated an osteochondral lesion with a high-intensity signal (arrows). (C) Nine months postoperatively, an X-ray image demonstrated remodeling of the osteochondral graft in the capitellum. (D) Nine months postoperatively, MRI indicated a smooth articular surface and incorporation of the graft into the host bone. Treatment for early-stage OCD of the elbow is principally nonsurgical, so that the patients usually cannot return to their sports activities for at least 1 year.1) If conservative treatment failed, patients may undergo surgery as the next step. In such cases, patients have to spend a much longer time in recovery and may lose the chance for further participation in school sports. If a patient desires an early return to their pre-injury activity level by means of surgery and their lesion is an advanced stage, osteochondral autograft appears to be one of several promising options for OCD.3) In our series, all patients returned to their baseball team and played in games within 4–7 months after their operation. They were pleased to be able to complete their baseball club activities in the remaiting time of their school lives. We believe that osteochondral graft is a promising and reliable treatment in patients with advanced OCD who desire an early return to their pre-injury sports activities. In an experimental study of osteochondral grafting in the treatment of OCD using sheep knees,10) osteochondral autografts healed and showed good maintenance of the joint surface. Despite good healing in the short term, microscopic examination revealed a small cleft between the osteochondral plug and the host cartilage. This incomplete healing might lead to osteoarthritic change in the long term. Controlled postoperative rehabilitation using an elbow brace improved the clinical results in our series. One limitation of the present study was the small number of patients. However, we conducted regular examinations in consecutive patients until they returned to their sports activities; we thereby obtained results supporting the effectiveness of the elbow brace. Another limitation is the absence of a control group. However, it is evident that postoperative rehabilitation using an elbow brace causes no harm and seems to be clinically effective. Therefore, it seemed ethically appropriate not to set up a control group. This study revealed that osteochondral autograft with postoperative rehabilitation using an elbow brace may be a reasonable treatment for young athletes with advanced OCD lesions of the elbow who desire an early return to their pre-injury sports activity levels. The authors declare that there are no conflict of interests. 1. Takahara M, Ogino T, Fukushima S, Tsuchida H, Kaneda K: Nonoperative treatment of osteochondritis dissecans of the humeral capitellum. Am J Sports Med 1999;27:728–732. 2. Lyons ML, Werner BC, Gluck JS, Freilich AM, Dacus AR, Diduch DR, Chhabra AB: Osteochondral autograft plug transfer for treatment of osteochondritis dissecans of the capitellum in adolescent athletes. J Shoulder Elbow Surg 2015;24:1098–1105. 3. Yamamoto Y, Ishibashi Y, Tsuda E, Sato H, Toh S: Osteochondral autograft transplantation for osteochondritis dissecans of the elbow in juvenile baseball players. Minimum 2-year follow-up. Am J Sports Med 2006;34:714–720. 4. Shimada K, Yoshida T, Nakata K, Hamada M, Akita S: Reconstruction with an osteochondral autograft for advanced osteochondritis dissecans of the elbow. Clin Orthop Relat Res 2005;140–147. 5. Takahara M, Mura N, Sasaki J, Harada M, Ogino T: Classification, treatment, and outcome of osteochondritis dissecans of the humeral capitellum. J Bone Joint Surg Am 2007;89:1205–1214. 6. Iwasaki N, Kato H, Masuko T, Funakoshi T, Minami A: Autologous osteochondral mosaicplasty for osteochondritis dissecans of the elbow in teenage athletes. Surgical technique. J Bone Joint Surg Br 2010;92(Suppl 1):208–216. 7. Bottlang M, Madey SM, Steyers CM, Marsh JL, Brown TD: Assessment of elbow joint kinematics in passive motion by electromagnetic motion tracing. J Orthop Res 2000;18:195–202. 8. Woo SL, Debski RE, Zeminski J, Abramowitch SD, Saw SS, Fenwick JA: Injury and repair of ligaments and tendons. Annu Rev Biomed Eng 2000;2:83–118. 9. Salter RB, Simmonds DE, Malcolm BW, Rumble EJ, MacMichael D, Clements ND: The biological effect of continuous passive motion on the healing of full-thickness defects in articular cartilage. An experimental investigation in the rabbit. J Bone Joint Surg Am 1980;62:1232–1251. 10. Burks RT, Greis PE, Arnoczky SP, Scher C: The use of a single osteochondral autograft plug in the treatment of a large osteochondral lesion in the femoral condyle. An experimental study in sheep. Am J Sports Med 2006;34:247–255.